Meandering 469-miles through Virginia and North Carolina, from the Shenandoah National Park to the Great Smoky Mountain National Park, the Blue Ridge Parkway snakes though some the East Coast’s most stunning scenery. For the last 40-miles—the loftiest stretch of the wilderness-shrouded thoroughfare—the parkway coils around the high peaks of Jackson County in western North Carolina, showcasing everything from wildflower-flecked Appalachian balds to dense evergreen forests to soaring, cloud-swirled summits. The options along the iconic roadway are abundant, but here are a handful of highlights along the parkway’s highest stretch. The bald, grass-blanketed summits of the southern Appalachians are among the rarest landscapes on the planet, mysterious hubs of biodiversity harboring a unique collection of alpine flora. 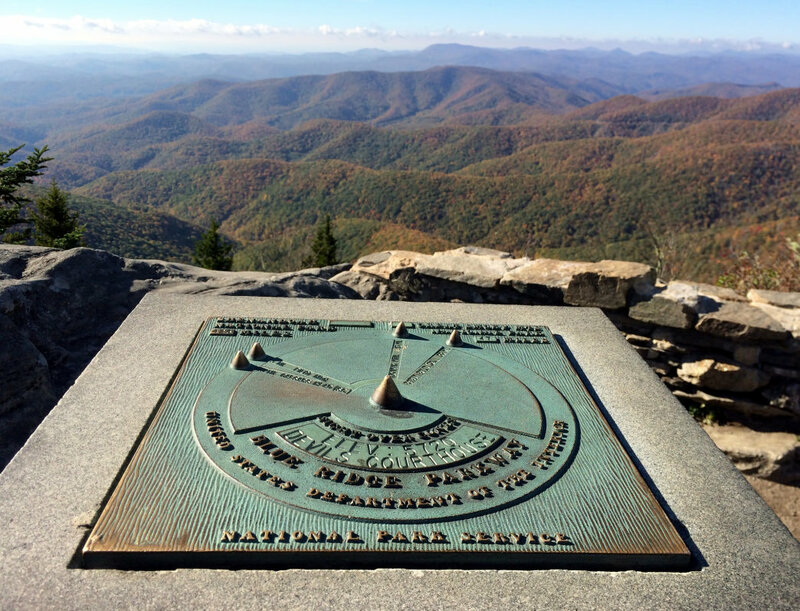 Black Balsam Knob is one of these trademark bald Appalachian summits—and the peak is ascendable courtesy of a panoramic hike on the Art Loeb Trail, easily accessible from the parkway. The most direct ascent is a mile-and-a-half roundtrip loop from the roadside trailhead along Forest Service Road 816, just after parkway milepost 420. Immediately after departing the roadway, the Art Loeb Trail briefly rambles through the forest before emerging into a lofty sweep of alpine meadows, rippling with wind-tousled grass, and strewn with occasional boulders. 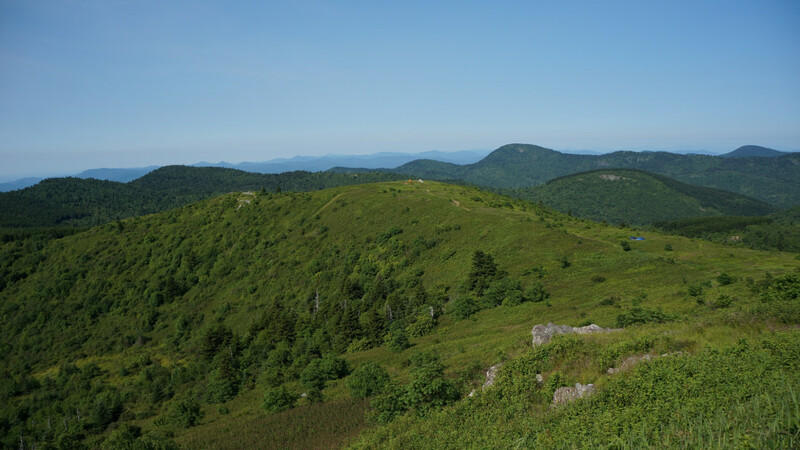 The trail traces the spine of a view-loaded ridgeline, flanked by wands of goldenrod, rambling to the easternmost edge of the Great Balsam range, and climbing to Black Balsam Knob’s 6,214-foot summit. The airy pinnacle offers 360-degree views—which include the jumbled, blue-hued peaks of the Great Smoky Mountains and Cold Mountain, the location credited with inspiring Charles Frazier’s 1997 historical novel of the same name. Embroiled with local lore—according to Cherokee legend, the craggy summit was the domain of a local giant, while other settlers claimed a clandestine cave in the cliff was frequented by the devil—today Devil’s Courthouse has been reclaimed by birds of prey. Peregrine falcons regularly ride the icy gusts swirling above the rocky façade. The craggy promontory provides the ideal habitat for the raptors, which were reintroduced in the nearby Sam Knob area nearly three decades ago. The rugged 5,720-foot outcropping is not solely the realm of birds—Devil’s Courthouse is also easily accessible courtesy of a half-mile hike on the Devil’s Courthouse Trail. While the trail is short, the trailside scenery is eclectic. The route meanders through mixed evergreen forest before climbing to a stone-encircled viewing platform that overlooks the undulating summits of the Shining Rock Wilderness to the west and the Carolina Piedmont to the east. The rock-chiseled summit is also a haven for rapidly disappearing alpine flora—including spreading avens and the rock gnome lichen. 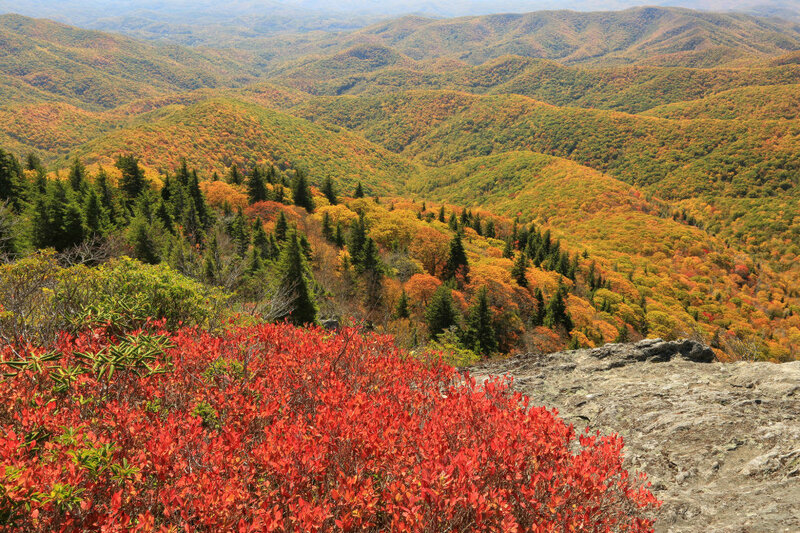 The brief Devil’s Courthouse hike can easily be expanded with additional mileage on the Mountains to Sea or Little Sam Knob Trails. Beginning at the Haywood-Jackson Overlook, the Richland Balsam trailhead is graced with peak-punctuated views of the massive Shining Rock Wilderness—but then, almost instantly the summit trail plunges into a thickly wooded spruce-fir forest. 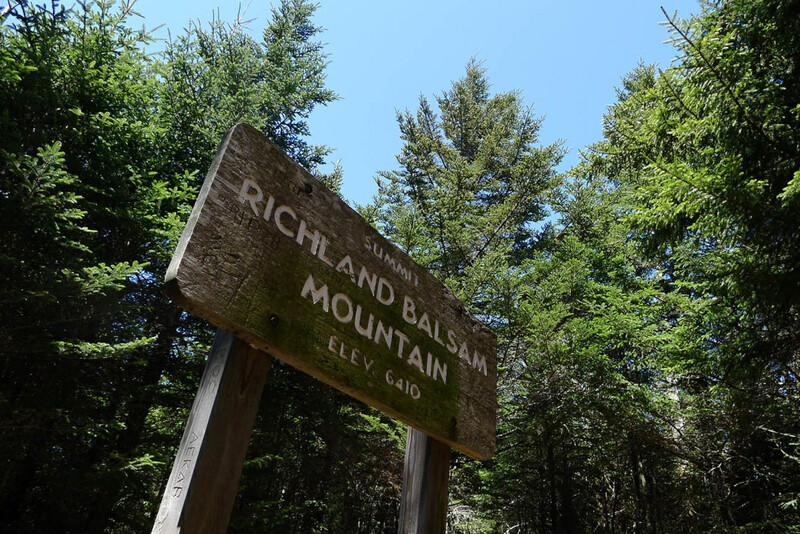 While the hike to the evergreen-tufted pinnacle is only about a mile-and-a-half round trip, you have some climbing to do: At 6,410-feet, Richland Balsam is the loftiest peak in the Great Balsam range, and the highest point accessible from the parkway. Although the summit route is brief, the hike has an almost mystical quality. The temperature drops almost instantly when the trail enters the cloud-nestled forest, and the closely huddled pine trees are fragrant and cloaked with a spongy, emerald-colored moss. Footsteps are muffled by the soft blanket of pine needles covering the trail. 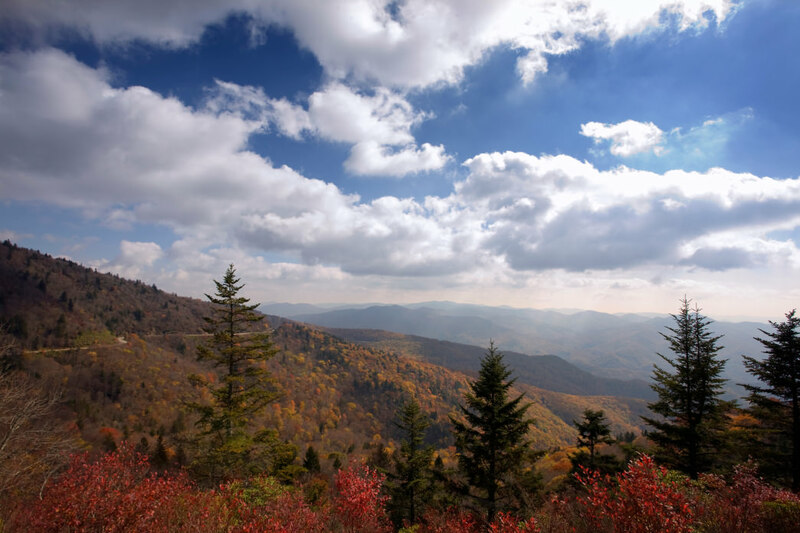 The high-elevation forest also provides habitat for everything from black bears to salamanders—the swaths of high-elevation evergreen forest dappling the southern Appalachian peaks, including Richland Balsam, are the global hotspot for the rare amphibians. Barely half a mile from the Haywood-Jackson Overlook, the Richland Balsam Overlook (6,053 feet) is the highest point on the actual parkway—and an ideal spot for iconic road trip pictures. This is the last visitor center before the parkway’s southern terminus. Even the parking lot views at Waterrock Knob are spectacular, with the shadow-dappled peaks of the Great Smoky Mountains rippling seamlessly toward the horizon. But from Waterrock Knob’s 6,292-foot pinnacle, the vistas are even better. The trip from the visitor center to the summit is brief—just over a mile round trip—but the ascent is anything but subtle. Fringed by American mountain ash, bursting with tiny cherry-red berries and tufty bunches of white aster, the rocky trails hugs the steep slope, offering views of Maggie Valley and the converging Plott Balsam and Great Balsam mountain ranges. Standing atop the wind-whipped, evergreen-shaded summit, the parkway appears like a distant ribbon of tarmac, framed by a jumble of blue-hued peaks tumbling into the distance. The parkway’s southern terminus puts visitors on the doorstep of the Great Smoky Mountains National Park, adjacent the Oconaluftee Visitor Center. Although providing a portal to one of country’s most exceptional hubs of biodiversity, the area surrounding the visitor center is also deeply entrenched with cultural history. Flanking the visitor center, the Mountain Farm Museum provides insights into daily life in the Great Smoky Mountains in the late 19th century. The town of Cherokee is also just a few miles from the southern end of the parkway, and the last leg of the roadway is fringed by the Qualla Boundary, a massive tract of land owned by the Eastern Band of the Cherokee people, edging the Great Smoky Mountains National Park. 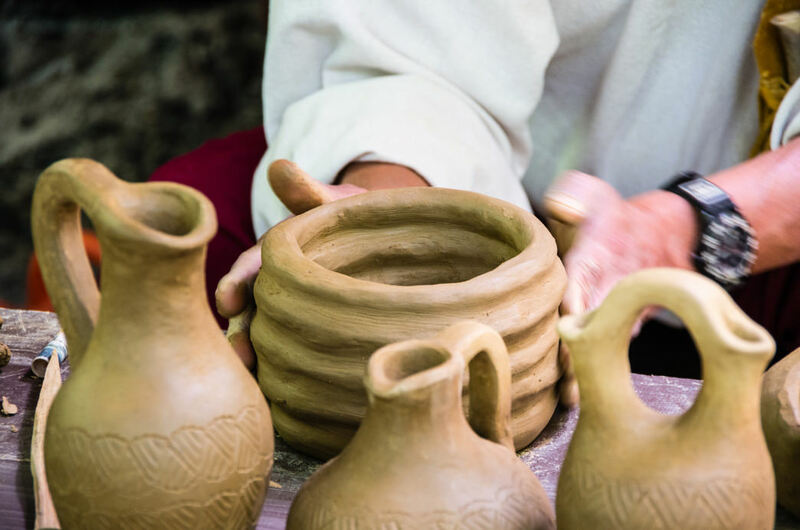 The legacy of the Cherokee and the tribe’s rich history in the area can be explored at the Museum of the Cherokee Indian, the Qualla Arts and Crafts Mutual, and the Oconaluftee Indian Village. Looking to spend the night? The historic Balsam Mountain Inn is located just off the Blue Ridge Parkway in the gap that divides the Plott Balsam and Richland Balsam mountain ranges. The hotel first opened its doors in 1908, and it is now on the National Register of Historic Places. An extensive renovation in the early 1990s created a hotel that blends classic charm with modern amenities. It’s one of dozens of great options for overnight accommodations near the parkway, including full-service resorts, cozy cabins, modern hotels, and charming bed & breakfasts.